Harry Bertoia for Knoll High Back Bird Chair and ottoman (designed 1952). Super Minty vintage example probably no earlier than the 1970's with a custom order purple tweed cloth. Condition: White epoxy coated frame, no breaks or paint chips and perfect shock-mounts. 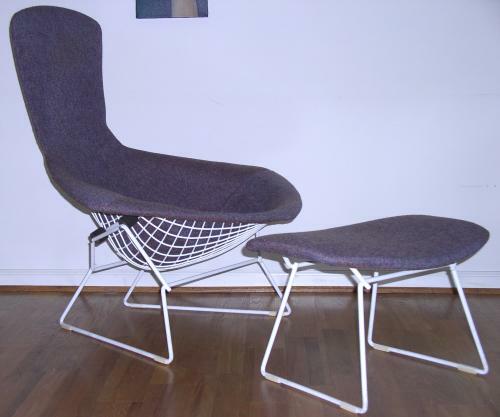 Both pieces covered in original Knoll fabric (mottled purple) with soft foam (no signs of hardening) in great condition. Chair and ottoman have all their original feet and upholstery retaining "S"-clips.